Routes and Methods: Cold Storage: Failure! We will ring the bells, turn on the lights, spin a few tunes on the street of Cold Storage. As part of its ongoing mission to open up the possibilities of and the potential for failure, Cold Storage will be hosting a book release party for the first release from the Journal of Aesthetics & Protest Press, Failure! 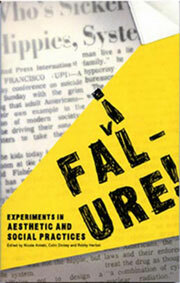 Experiments in Aesthetic and Social Practices. Music provided by DJ's Jugg Thugg and Sweaty T. And did we mention one pot of soup will also be served? So bring your favorite bowl/mug/spoon. Oh yeah, also bring lots of your favorite beverages for brown bagging. Failure! Experiments in Aesthetic and Social Practices is a collection of essays and interviews that looks squarely at the implications of the perceived personal, public and ideological wreckages that ceaselessly pile up, hurl at our feet and choke our wings (to paraphrase Walter Benjamin). Contents include a look at the afterlife of Valerie Solanas and her Scum Manifesto, connections between Frank Gehry and the 3 Stooges, an exploration of the Digger inspired Morningstar Commune in Northern California which was deeded to God, a consideration of the finality of death and its implication for AIDS activism, and a series of interviews with contemporary artists. Contributors include: Catherine Lord, Doug Harvey, Sam Green, Sam Durant, Yoshua Okon, Eduardo Abaroa, William Pope.L, Temporary Services, Assume Vivid Astro Focus, Catherine Hollander, Zoe Trodd, David Schafer, Richard Dedomenici, Alex Juhasz, Sarah Kanouse, Lisa Anne Auerbach, Sarah Lewison, John Conley, and Tommy Williford.